Mia Lucci's Woodfired Pizza, on Central Avenue, takes the incorporation of "wood" to a whole new level. If you've ever wondered what a pizzeria in the northern latitudes of Scandinavia might look like, you found it. Mia Lucci's used to be Truman's restaurant, a brick-clad building with classic striped awnings and a neon sign. 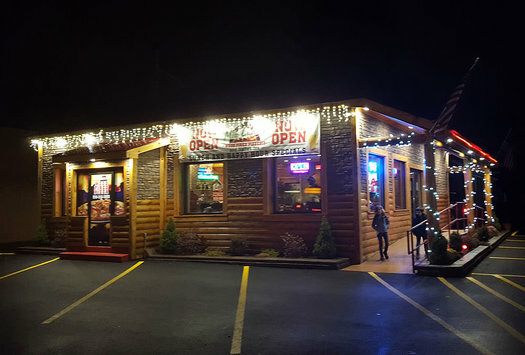 Now, the building resembles a log cabin replete with a wood-carved bear next to a gas fireplace and timber decor and beams. Huge televisions line the walls and play cable news shows, but considering the pizzeria has become a family-friendly quick-dinner option, there is little doubt that one of those TVs could switch to Nickelodeon with a gentle request. It's good! I don't think it will win any best-of pizza lists (even though the sign says otherwise), but it's hard to beat drinks, salad, wings, and pizza (with a generous tip) for a family of four under $40. Mia Lucci's has woodfired in the name, but it appears the oven is a hybrid that use both wood and gas, as most "woodfired" ovens in the area are. (Exceptions include Anna's or Restaurant Navona.) The crust is blistered where it ought to be, and doughy in the other places. Big bubbles of hot air and delicious, unctuous grease lay just below the surface and make for fun arguments between anxious children waiting to pop them. 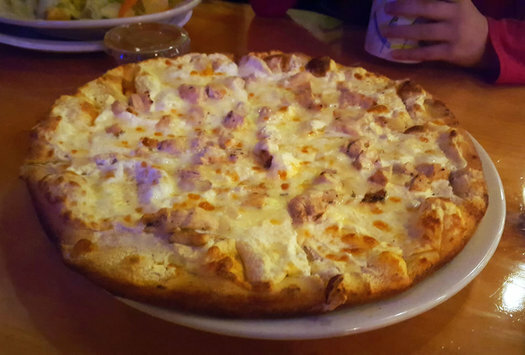 Chicken spiedie pizza -- our chosen pie ($12.99 for 10") -- gives a vinegary kick that cuts through copious layers of molten cheese and classic white sauce. Buffalo wings (10 for $8.99) are standard fare, but a great example of what sticking to the basics can lead to. 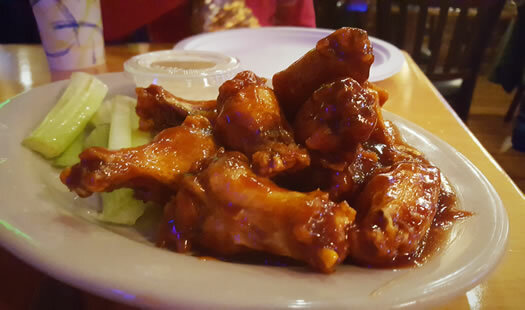 Roasted until tender and fried until crisp, these wings will satisfy even the most discerning Buffalo aficionado. A green salad ($6.99) is served with creamy balsamic dressing, long tendrils of shaved carrot, and extra-crunchy pre-made croutons is enough to balance out the rich meal. The open kitchen and large take-out counter gives the dining-in customer a bit of confusion. Do we seat ourselves, pour our own drinks (a soda fountain stands on the cusp of kitchen and dining room), order at the register? Seat yourselves and a boisterous greeter will come to take your order, but don't expect him to come back too often to check in on you. Once you're there and have your food, you're on your own. Pay at the register. Impeccable, accommodating service is not really what you are here for anyway. You are here for quick "it does the job" pizza that satisfies hectic family schedules, picky eaters, and the post-holiday calorie blow-out that you are sacrificing your diet for. Mia Lucci's likely won't become your favorite pizza joint, but I have no doubt it will be a reliable stand-by in your dinnertime rolodex. Bellini's also has a true wood oven for pizza, no gas, or anything else. Why did you guys stop doing pizza wars? Iâ€™m surprised to see this place make the pages of AOA. Even by your own admission, itâ€™s simply a â€œdoes the jobâ€ pizza joint. Iâ€™d considered writing about Mia Lucciâ€™s after the first visit, but after a few more visits I came to agree with your assessment. I donâ€™t consider it worth the ink. Maybe someday. Although the owner is passionate about pizza, theyâ€™re still a bit inexperienced. Inexperienced in their approach to pizza, AND the service industry. Thereâ€™s plenty of great pizza in our area (and slightly beyond). As well as, PLENTY of â€œFriday-night-jointsâ€, places good enough for that quick, almost mandatory, Friday night pie. Letâ€™s focus on the great stuff, the mediocre will take care of itself. @Nick -- thanks for that update! I didn't realize, my mistake :( Which Bellini's in particular, the one in Clifton Park? I'd love to check it out! I'm on a stupid diet (food writing, man) but should probably make it a goal for 2017 to check out other pizza joints who claim to be "wood fired," just to be sure. @Nick: We ended the Tournament of Pizza because it felt like it had become repetitive and we figured it was better to bid if farewell before it burned out. Out of curiosity, what are your go-to "Friday-night-joints?" The first time I went there, I thought a great crust was let down by a blend sauce. I've tried it again twice, and they have improved quite a bit. Maybe not yet worthy of regional renown, but certainly one of the better pizzerias between Wolf and Balltown. Hopefully, they'll keep at it and meet OCtG's standards.